Ready to rejuvenate your look this year? 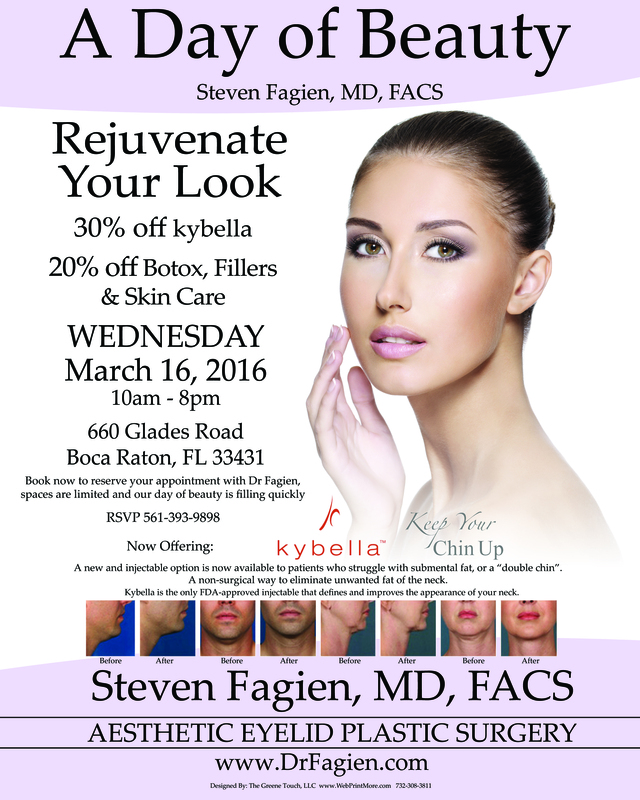 On Wednesday March 16, Dr. Fagien will be hosting “A Day of Beauty” from 10 A.M to 8 P.M. During this time, he will be offering 20% off Botox, fillers, and skin care products as well as 30% off kybella. Experience today’s premier cosmetic products and exclusive procedures performed by one of the world’s leading aesthetic eyelid surgeons, Dr. Steven Fagien. Appointment times will fill up quickly though, so call now to reserve your spot and revitalize your look! Click here to view a printable PDF version of the flyer.